A combination of loose monetary conditions, solid labor markets, healthy global trade and higher commodity prices led global growth to expand in the second half of 2018 at rates last seen nearly seven years ago. According to preliminary estimates by FocusEconomics, the global economy expanded 3.5% annually in Q4. The print matched Q3’s expansion, which had represented the fastest acceleration since early 2011. Because of the strong growth observed in the second half of 2017, the global economy rose 3.3% in 2017, up from 2.7% in 2016. Q4’s reading reflected strong growth in the United States on the back of robust consumer spending, which was driven by a tight labor market and rising housing prices. Moreover, high levels of business confidence propelled capital expenditure. China also contributed positively to Q4’s robust reading as the economy defied fears of a pronounced slowdown, expanding at Q3’s stellar rate of 6.8% in Q4. Moreover, full-year 2017 data showed that China’s economy is gradually transitioning towards a more balanced economic model: Services and consumption led growth in 2017, while all-important investment growth slowed noticeably. While annual growth moderated in the United Kingdom, a quarter-on-quarter analysis shows that the economy was in relatively good shape in Q4 on the back of a solid performance in the service sector. With GDP data still outstanding for most of the world’s largest economies, leading indicators suggest that economic growth remained robust in the Euro area in Q4 as the region benefits from a multi-year low unemployment rate, an accommodative monetary stance and a dynamic external sector. Similarly, Japan’s economy continued to growth at a healthy pace in Q4 mostly due to strong demand for Japanese goods, which is boosting economic activity in the island. Among developing nations, the economic recoveries appear to have strengthened in Brazil, India and Russia. The increase in commodity prices has provided relief to some battered developing economies this year. Sub-Saharan Africa is expected to have performed better in 2017 despite mounting geopolitical threats, while commodity export-driven countries in Latin America and Eastern Europe also benefited from higher prices for primary products. The main exception is, however, the Middle East and North Africa region, as the implementation of the OPEC-led oil cuts dramatically hit the all-important oil sector. Global growth is expected to remain strong this year, and risks to the economic forecast for 2018 are skewed to the upside. Despite monetary tightening in the U.S., financial conditions remain loose across the globe as other key central banks such as the BoJ and the ECB flood financial markets with cheap money stemming from their accommodative monetary policies. Loose monetary conditions are supporting consumer confidence and capital expenditure. Solid global economic dynamics are tightening job markets, which is reverberating positively in household spending. Despite the stream of positive news, political uncertainty could jeopardize the growth momentum. The Euro area managed to weather last year’s election cycle well, putting aside fears of a gradual disintegration of the union. While the breakup of the European Union is no longer in the cards, political turmoil in some countries, especially in Italy and Spain, are threatening to derail the region’s bright economic performance. Moreover, the uncertain outcome of Brexit negotiations adds additional uncertainty to the economic outlook in the UK and the continent. In the United States, President Donald Trump is gradually implementing his “America First” policy. In January, the United States imposed tariffs on solar panels and washing machines, increasing friction between the U.S. and some of its key trading partners, notably China and South Korea. Moreover, officials from Canada, Mexico and the United States wrapped up the sixth round of NAFTA negotiations on 29 January. While they stated that the round was “a step forward”, tough challenges must be addressed before a new deal can be struck. 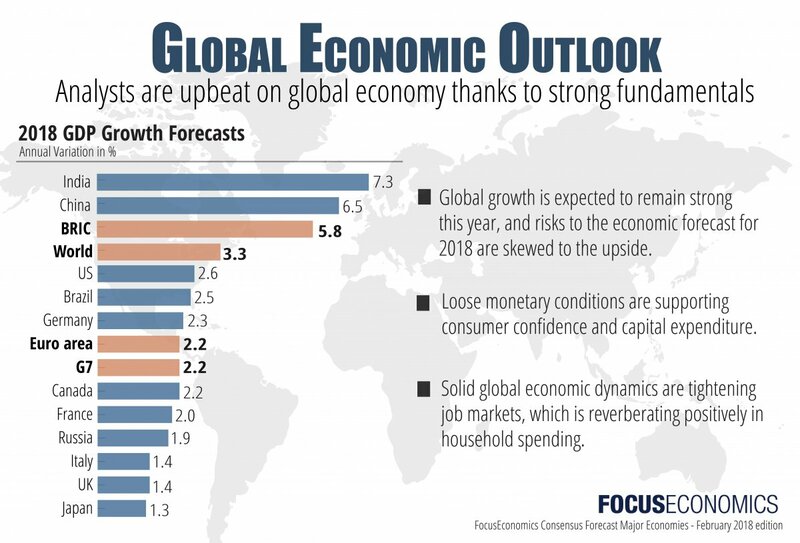 FocusEconomics panelists expect the global economy to grow 3.3% in 2018, which is unchanged from last month’s estimate. In 2019, the global economy is seen decelerating slightly, to 3.2% growth. This month’s stable 2018 outlook for the global economy reflects a general improvement in prospects among most advanced economies, which was offset by rising uncertainties in some emerging market economies. Growth prospects for the Euro area, Japan, the United Kingdom and the United States were upgraded, while the GDP forecast for Canada was left unchanged. Among developing nations, China’s strong growth momentum continues to shore up dynamics in the Asia (ex-Japan) region. However, analysts are wary about a potential slowdown in China in 2018, while the economic recovery in India is expected to be less vigorous than previously thought. Russia’s economic recovery, which is forecast to pick up this year, and robust economic dynamics in the Euro area are propelling growth in Eastern Europe. Growth prospects for the economies of the Middle East and North Africa, and Sub-Saharan Africa are limited by ongoing geopolitical threats and large economic imbalances. The economic outlook for Latin America remains clouded by uncertainty ahead of this year’s election cycle. Healthy GDP data for the fourth quarter rounded off a strong year of growth in the U.S. economy. Household spending rose in Q4 at a solid rate on continued job growth, increased wages and high stock prices, while fixed investment benefitted from sky-high business sentiment and reconstruction efforts following weather-related disruptions in Q3. The GDP report came on top of a string of upbeat data releases suggesting momentum likely carried over into 2018. Survey-based manufacturing data for December and January showed soaring order books, while initial jobless claims continued to decline up to the week ending on 20 January, an early indication that employment growth remained resilient at the start of the year. Despite the rosy economic picture, political wrangling dominated headlines in recent weeks. Following a brief shutdown, Congress struck a deal on 22 January to reopen the federal government through 8 February but failed to resolve the underlying issues that caused the shutdown, including an agreement on DACA. An accommodative fiscal stance should lift consumer spending and non-residential investment this year, while an exceedingly tight labor market, strong momentum in the housing sector and upbeat stock prices will continue to buttress economic activity. FocusEconomics panelists see growth of 2.6% in 2018, which is up 0.1 percentage points from last month’s estimate. In 2019, growth is seen moderating to 2.1%. Incoming data continues to suggest that the recovery is motoring along at full speed. The domestic economy is likely in the driver’s seat, buoyed by a tightening labor market, high sentiment and record-low interest rates. The unemployment rate inched down to a new multi-year low in October, industrial production gathered steam in November and economic sentiment soared to an over 17-year high in December. All-in-all the Eurozone economy is expected to have had a bumper year in 2017, growing at the fastest pace since 2006. Brisk economic growth has caused the euro to soar in recent months, and the currency hit a new three-year high on 25 January. Moreover, leading data for 2018 revealed that the economy started the year on a positive note: The composite PMI rose to a nearly 12-year high in January. The Eurozone’s outlook is bright. Last year’s tailwinds to growth remain largely in place, and the economy is expected to grow robustly this year on the back of accommodative monetary policy, falling unemployment and high sentiment. FocusEconomics analysts project that GDP will expand a solid 2.2% in 2018, which is up 0.1 percentage points from last month’s forecast. In 2019, GDP is forecast to grow 1.9%. Strong global demand, especially for high-tech electronics, and the Bank of Japan (BoJ)’s ultra-accommodative monetary policy continued to shore up economic activity in Q4. Healthy international demand for Japanese goods sent the manufacturing PMI to multi-year highs, and boosted capital expenditure. Robust economic activity is increasing job creation, with the unemployment rate hitting a 25-year low in November. Moreover, a tighter job market is adding upward pressure on salaries, which is translating into stronger retail sales. Japan, along with another 10 countries, agreed on 23 January to sign a new version of the Trans-Pacific Partnership trade deal on 8 March, without the U.S. The accord is a win for Prime Minister Shinzo Abe, who had struggled to save the pact following President Donald Trump’s decision to pull the U.S. out from the agreement in January 2017. Economic growth should remain strong this year on the back of resilient global trade and accommodative financial conditions. Japan’s stellar growth trajectory could, however, be clouded by a disorderly slowdown in China, higher trade barriers and an appreciation of the JPY due to mounting geopolitical risks. FocusEconomics panelists see the economy growing 1.3% in 2018, which is up 0.1 percentage points from last month’s forecast. For 2019, they see growth at 1.0%. The economy picked up pace in the final quarter of 2017, according to preliminary data. Services—particularly business services and finance—and manufacturing powered growth, with manufacturing likely boosted by buoyant external demand. However, consumer-facing sectors were limp amid a continuing decline in real wages. This fits with a picture of weak retail sales data in Q4. In addition, December’s service PMI highlighted subdued business confidence and investment, raising concerns about the sustainability of growth in the sector going forward. More positively, the labor market was surprisingly robust in August–November; there was a surge in job creation compared to the prior quarter, and the unemployment rate remained at a multi-decade low. On the international front, on 29 January the EU approved its directives for the next phase of Brexit negotiations, allowing discussions on a transition agreement to begin in earnest. Global inflation rose from November’s 2.6% to 2.7% in December, according to an estimate by FocusEconomics that excludes Venezuela due to the lack of economic data and hyperinflation in the country. The print was the result of higher inflationary pressures in most emerging economies due to hikes in administered prices and higher food prices stemming mostly from weather-related shocks. Despite the increase in inflation, price pressures remained at historically low levels in emerging market nations. Conversely, inflation receded slightly among most advanced economies in December. Although the global economy is firing on all cylinders, low inflation levels across the world are giving key central banks leeway to maintain accommodative monetary policies. In this regard, the European Central Bank and the Bank of Japan both stated in recent meetings that they will keep their loosen monetary setting stable for the foreseeable future. The FocusEconomics panel projects global inflation of 2.8% for 2018, which is up 0.1 percentage points from last month’s estimate. Next year, the panel sees inflation broadly stable at 2.7%. If the hyperinflation episode in Venezuela is factored in, global inflation will reach 9.7% in 2018 and 4.9% in 2019.